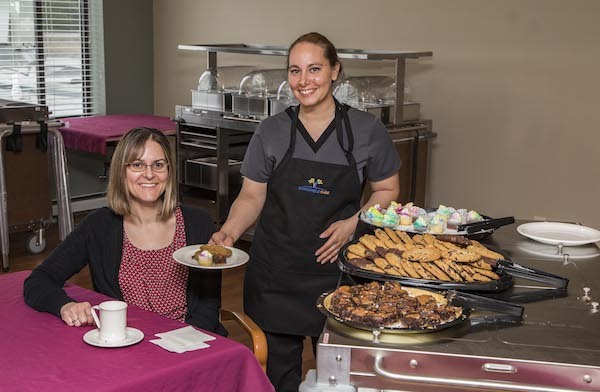 Schofield Care residents are enjoying more choices in their dining menu thanks to new "direct dining" carts made possible by the Statler Foundation. "We are very excited to be the recipient of a $36,000 grant from the Statler Foundation to transform our food and dining services for hundreds of residents," noted Stephanie Grucza, DT, director of Dietary Services at Schofield. "With this transformation, we are enhancing resident-choice in selecting their menu items as well as encouraging more customer-focused interaction between our Residence staff and the residents." With the transformation, the Residence's dietary staff, CNAs and Activities staff are helping to ensure the resident receives the entre, side dishes, dessert and beverage they would like and that fits with their dietary plan. The dining project also includes a newly renovated dining space. In recognition of The Statler Foundation's support, Schofield will name the second-floor dining space "The Statler Room." Schofield Residence is an award-winning 5-Star nursing home on Medicare.gov offering short-term rehab services and long-term care in Kenmore. Founded in 1910, Schofield Residence is a not-for-profit organization and is locally operated.